What was on YOUR lunchbox? Adweek magazine recently published its Kids Issue, with series of articles about children and advertizing. One piece focused on kids' exposure to ads. There was also a great profile on kids' television mastermind Fred Seibert; an article on finding the next big kids tv show; and a piece about the biggest young stars of YouTube. But our favorite article was a peek at the brands featured on kids' lunch boxes these days. 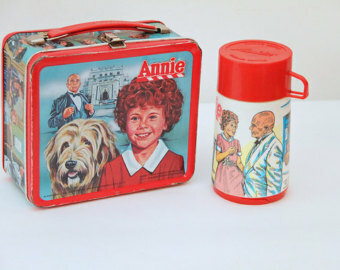 At FableVision, we remember when your lunchbox was a big part of your identity as a kid. So we polled the audience! We asked the studio what was on THEIR lunchboxes when they were a kid and people had some great memories (and photos!) to share. Now we ask you: What was on YOUR lunchbox? Let us know! We're loving these retro brand pics. Bob Flynn, Director of Art and Animation Transformers "This is the one I remember the most, I had a few others. I was a cold lunch kid for a long time—well into fourth grade. When I did my Bravest Warriors comic book over for New York Comic Con, and I wanted to channel a washed out (no yellow) '80s space color scheme—I subconsciously/consciously (didn't actually reference it on purpose) channeled the color scheme from my lunchbox. Including the pink burst and chrome-ish lettering. Weird how similar they are looking at them together." "I had this lunchbox and loved it to pieces. Literally. I wish I still had it!" Ryan McNulty, Developer and Game Designer Return of the Jedi "This one was my favorite. I wish I still had it!" "I have a pretty vivid memory of two lunch boxes: CareBears and Popples." Brian Grossman, Technical Director Hardy Boys Mysteries "I definitely have memories of my Hardy Boys Mysteries lunch box. I can distinctly recall raising my hand in my velour shirt, corduroy pants and bowl haircut, asking Ms. Martin, the cafeteria aide, to help me unscrew the Thermos that my mom screwed on too tightly." "I had this The Little Mermaid lunch box, with a matching Thermos!" Bright eyed and caffeine fueled, the FableVision Extra Life Team assembled at the Boston studio at 8 a.m., on Saturday. An hour later there would be pancakes and games – lots and lots of games.